There are boring bits (like how much money we have) but there are also über fun things like free food, chatting about our campaigns and also getting to enjoy some super cool company. Some other official stuff needs to happen too – like voting on some proposed changes to our constitution. This is decided by RainbowYOUTH members – so if you are one, come along and help decide. 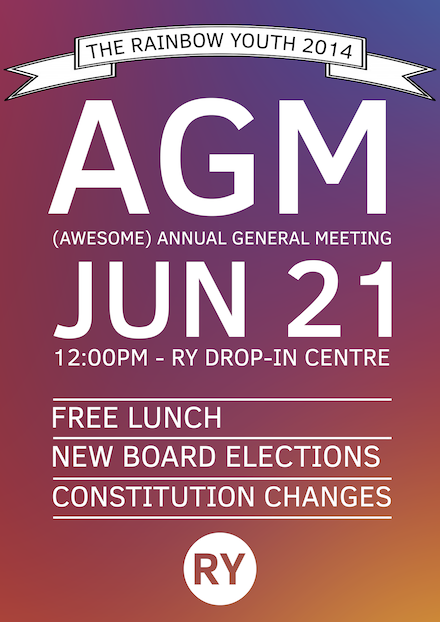 We propose that the application process for running for the RY executive board is changed from nominations from the floor to applications submitted in writing at least a week in advance of the AGM to ensure that applications are well thought-out and that applications can receive feedback and guidance prior to presenting themselves in person at the AGM.